Eye Care Directory offers up-to-date information about the optical eyeglasses stores and eye doctors for your vision needs in the Clichy of Isla de Francia. You may arrange an free eye exam, buy prescription eyeglasses, RX sunglasses or donate your old eyeglasses by using the contact information in the directory. What are good essential oils for eye puffiness? In my opinion, the tea oils will reduce your puffiness of the eyes with good effect because of the calming role. You could take this into consideration. You may also choose the rose essential oils which will make your skin of the eyes smooth. At the same time, your eyes skin will feel comfortable. You could have a try. Do ray ban sunglasses have serial numbers? Ray-Ban sunglasses are popular with many people included superstars, such as Eric Church who always wears Ray-Ban Wayfarers. Bausch & Lomb founded Ray-Ban, an American brand of sunglasses in 1937 and Ray-Ban Wayfarer sunglasses have been manufactured by Ray-Ban since 1956, when their design was a revolutionary break from the metal eyewear of the past. Well, here I recommend some measures to spot if they are real for you. First, look at the Ray-Ban box carefully to determine there is a recycling logo and the serial number on it. Second, pay attention to the case which was engraved a gold logo on it and says "Luxottica", moreover, this logo not printed. Third, check the engraved Ray-Ban logo. You can read the engraving on right-side up when holding the sunglasses upside down, if not, you get a pair of fakes. Sum up, all these just my views and you get many useful ways to spot them online of get information from your friends. 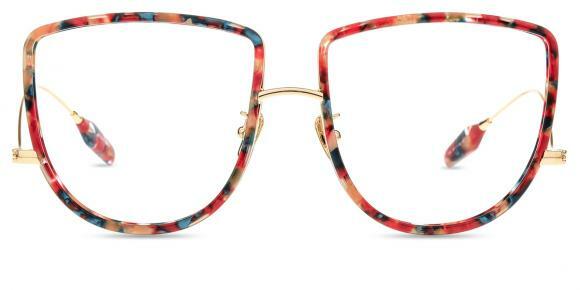 Do men wear prada glasses ? Prada mainly produce fashion stuff for girls and women, but it doesn't mean they design nothing for men. They launch glasses for men each year. One of my male friends is a huge fun of prada glasses. His sunglasses and normal glasses are all bought from prada. I feel thats cool and clam, and they hold a sense of noble. Prada plays safe card, so you'd never be out of style. why almost every pair of metal eyeglasses have nose pads? Almost every pair of metal eyeglasses do have nose pads. 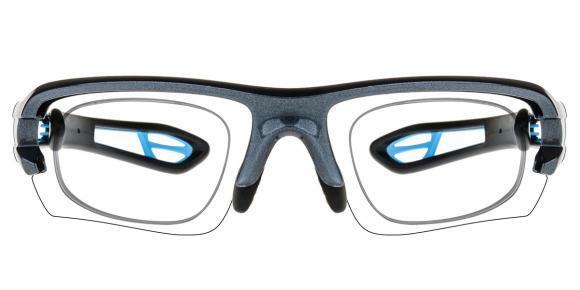 The nose pad is often a small plastic piece, usually no thicker than the lens of the glasses themselves. Its main purpose is to protect the nose from unwanted pressure from the tight frames of the glasses. Or the reason is that the metal frame can not be processed to sit on the nose well, so the nose pad is a must. So, if you have a small nose, then a metal frame with built-in nose pads may be a great option for you. It is difficult for you to get plastic frames to stay in place without the benefit of nose pads holding them in place. Why do blue eyes turn grey? Sometimes it is normal to get changed colors in the eyes, because there are some deposit of melanin in the iris whose color predominates the color of your eyes. However, in some cases the change of eye colors can be a sign of getting a certain eye disease such as glacoma, cataracts, and so on. In your case, you should go to the doctor's to have your eyes carefully examined so as to find out whether the eyes have cataracts. Cataracts are the result of the degeneration of crystalline lenses where there starts to have white or grey muddiness hindering the normal vision. This usually is caused by increasing age or outer impact such as over exposure to the ultraviolet rays or blue light. You had better pay attention to protecting your eyes from these harms. How to clean my spy sunglasses? Cleaning and preserve your sunglasses properly will keep it in good condition. There are several tips that you can refer to. 1. For most sunglasses, when you fold them together, go with the left side first, so that it will keep the frame in the original structure and avoid and deformation. 2. When you don't wear it, fold it together and put it into special box or bag with a piece of soft cloth covering it. Keep it away from sharp and hard object, and materials or electric. 3. When you are taking it off, use both of your hands to get the two legs, and take it off from the front. 4. When the sunglasses are dirty with dusts, grease, sweat or make-up, clean it with warm water and mild detergent. After cleaning, use a piece of soft cloth to absorb the water. Don't wipe it otherwise there will be trace on it. 5. Don't soak sunglasses in water for too long or expose it under sunshine for too long. 6. Due to the material of glasses, it is common that the frame deforms a little after a period of time. Go to the store and adjust it periodically. Does anyone tell me who makes revo sunglasses? Revo is a popular luxury brand who design and sell several kinds of goods include glasses,the concept of their product are easy for a lot of people to understand.But like the other luxury firms,then have business relationship with some factories ,because they won't manufacture them,they just design then sell. So let me tell you which company do this for them---- The Luxottica Group. The Luxottica group's own brands include the world's most popular sunglasses and optical glasses brand Ray-Ban (Ray-Ban) and Vogue, Persol, Arnette and Revo brands. It's a professional glasses manufacture,they can make every concept conceived by super designers finally come true. As we know, the sunglasses are mainly used to protect their eyes from the uv rays or other bad lights. They could protect the eyes to some degree because of the special coating part. However, many people now use the sunglasses for the use of making cool besides the practical use. That is why you see many people wearing the sunglasses to a day glow. They may want to show their coolness. Does an eye infection go away by itself? Eye infections can be bacterial, viral, or fungal. You can get infections from 2 "paths". Either internally from viruses that lay dormant in your nerves such as (freaky i know! ), like herpes, or after an injury from the outside environment. People that wear contact lenses are more likely to get an infection actually. But this is when they don't do the right thing, and not follow instructions. Some contact lenses are only meant to be worn for small periods of time, eg coloured contact lenses or normal daily contact lenses. You shouldn't sleep with these in your eyes overnight! Anywho the internal herpetic infections are handled, but can always pop up again. The external ones are often handled by the eye with minimal drama. White blood cells come into the eye, gobble up (phagocytose) the virus or infected cells, and your bodies cells start re-building any damage.So, to summarise. Most eye infections resolve with minimal or no treatment. Some infections are more difficult than others for your body to deal with. AND, you should see a doctor if your eyes hurt for any reason. Once your eyes change the color, you may take special attention to it. Usually the liver problems or other body problems may cause the yellow symptom of the eyes. You should have the good rest for the eyes, not sitting in front of the computers for a long time. You should also have the healthy diet, eating more green food with vitamin C to moisture the eyes.